Earlier this summer Benedict urged the nations of the world to embrace each other in solidarity and work towards “an ever more just distribution” of wealth,” warning that “It is not possible to continue using the wealth of the poorest countries with impunity, without them also being able to participate in world growth.” (Zenit: “Pope Urges Just Distribution of Goods” June 1, 2007). Telling the Parable of the dishonest but very crafty administrator, Christ teaches his disciples the best way to use money and material riches, that is, to share them with the poor, thus acquiring their friendship, with a view to the Kingdom of Heaven. “Make friends for yourselves by means of unrighteous mammon,” Jesus says, “so that when it fails they may receive you into the eternal habitations” (Lk 16: 9). Michael Joseph of Vox Nova has conveyed his thoughts on Benedict’s remarks (along with a lively combox discussion) in “The Logic of Profit and the Logic of Equal Distribution” Vox Nova Sept. 24, 2007). Both capitalism and Marxism promised to point out the path for the creation of just structures, and they declared that these, once established, would function by themselves; they declared that not only would they have no need of any prior individual morality, but that they would promote a communal morality. And this ideological promise has been proved false. The facts have clearly demonstrated it. The Marxist system, where it found its way into government, not only left a sad heritage of economic and ecological destruction, but also a painful oppression of souls. And we can also see the same thing happening in the West, where the distance between rich and poor is growing constantly, and giving rise to a worrying degradation of personal dignity through drugs, alcohol and deceptive illusions of happiness. Benedict XVI’s stinging criticism of both Marxism and capitalism this afternoon may have caught some off-guard used to thinking of him as a consumate conservative, but it shouldn’t surprise anyone who knows Joseph Ratzinger’s history. . . . In 1988, then-Cardinal Joseph Ratzinger published a collection of essays under the title of Church, Ecumenism and Politics. In it, he argued that capitalism is little better than national socialism or communism, in that all three propose false idols (prosperity, the Volk, and the state, respectively). Ratzinger said that to build a humane civilization, the West must rediscover two elements of its past: its classical Greek heritage and its common Christian identity. From the classical era, Ratzinger wrote, Europe should rediscover objective and eternal values that stand above politics, putting limits to power. Ratzinger used the Greek term eunomia to describe this concept of the good. In that sense, one could say that Ratzinger proposed a eunomic, rather than capitalist, model of Western culture. 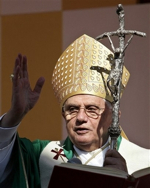 Over the years, Ratzinger has been close to the Communio school within Catholic theology, which stresses the need for cultures to take their point of departure from the Christian gospel rather than secular ideologies. Its primary exponents have repeatedly criticized capitalism for promoting an ethos of individualism and “survival of the fittest” that is at odds with the communitarian thrust of Catholic social teaching. Since becoming pope, Benedict has often criticized what he considers the injustices of a growing neo-liberal system of economic globalization. The most extensive work that I could find online — generously made available by the Acton Institute — is Ratzinger’s Market Economy and Ethics, a version of which was presented in 1985 in a symposium in Rome, “Church and Economy in Dialogue.” It was published in English under the title “Church and economy: Responsibility for the future of the world economy,” Communio 13 (Fall 1986): 199-204. Following the tradition inaugurated by Adam Smith , this position holds that the market is incompatible with ethics because voluntary “moral” actions contradict market rules and drive the moralizing entrepreneur out of the game. For a long time, then, business ethics rang like hollow metal because the economy was held to work on efficiency and not on morality. 4 The market’s inner logic should free us precisely from the necessity of having to depend on the morality of its participants. The true play of market laws best guarantees progress and even distributive justice. This determinism, in which man is completely controlled by the binding laws of the market while believing he acts in freedom from them, includes yet another and perhaps even more astounding presupposition, namely, that the natural laws of the market are in essence good (if I may be permitted so to speak) and necessarily work for the good, whatever may be true of the morality of individuals. These two presuppositions are not entirely false, as the successes of the market economy illustrate. But neither are they universally applicable and correct, as is evident in the problems of today’s world economy. . . . Even if the market economy does rest on the ordering of the individual within a determinate network of rules, it cannot make man superfluous or exclude his moral freedom from the world of economics. It is becoming ever so clear that the development of the world economy has also to do with the development of the world community and with the universal family of man, and that the development of the spiritual powers of mankind is essential in the development of the world community. These spiritual powers are themselves a factor in the economy: the market rules function only when a moral consensus exists and sustains them. For while the market economy rests on the beneficial effect of egoism and its automatic limitation through competing egoisms, the thought of just control seems to predominate in a centralized economy, where the goal is equal rights for all and proportionate distribution of goods to all. The examples adduced thus far are certainly not encouraging, but the hope that one could, nonetheless, bring this moral project to fruition is also not thereby refuted. It seems that if the whole were to be attempted on a stronger moral foundation, it should be possible to reconcile morality and efficiency in a society not oriented toward maximum profit, but rather to self-restraint and common service. Thus in this area, the argument between economics and ethics is becoming ever more an attack on the market economy and its spiritual foundations, in favor of a centrally controlled economy, which is believed now to receive its moral grounding. Capitalism and Marxism: Philosophical “Siamese Twins”? This determinism includes the renunciation of ethics as an independent entity relevant to the economy. [In Marxism], religion is traced back to economics as the reflection of a particular economic system and thus, at the same time, as an obstacle to correct knowledge, to correct action — as an obstacle to progress, at which the natural laws of history aim. . . . It is also presupposed that history, which takes its course from the dialectic of negative and positive, must, of its inner essence and with no further reasons being given, finally end in total positivity. That the Church can contribute nothing positive to the world economy on such a view is clear; its only significance for economics is that it must be overcome. A morality that believes itself able to dispense with the technical knowledge of economic laws is not morality but moralism. As such it is the antithesis of morality. A scientific approach that believes itself capable of managing without an ethos misunderstands the reality of man. Therefore it is not scientific. Today we need a maximum of specialized economic understanding, but also a maximum of ethos so that specialized economic understanding may enter the service of the right goals. Depends on your definition of “capitalism”? More and more, in many countries of America, a system known as “neoliberalism” prevails; based on a purely economic conception of man, this system considers profit and the law of the market as its only parameters, to the detriment of the dignity of and the respect due to individuals and peoples. At times this system has become the ideological justification for certain attitudes and behavior in the social and political spheres leading to the neglect of the weaker members of society. Indeed, the poor are becoming ever more numerous, victims of specific policies and structures which are often unjust.
. . . The answer is obviously complex. If by “capitalism” is meant an economic system which recognizes the fundamental and positive role of business, the market, private property and the resulting responsibility for the means of production, as well as free human creativity in the economic sector, then the answer is certainly in the affirmative, even though it would perhaps be more appropriate to speak of a “business economy”, “market economy” or simply “free economy”. But if by “capitalism” is meant a system in which freedom in the economic sector is not circumscribed within a strong juridical framework which places it at the service of human freedom in its totality, and which sees it as a particular aspect of that freedom, the core of which is ethical and religious, then the reply is certainly negative. “The rule of law is the necessary condition for the establishment of an authentic democracy”. For democracy to develop, there is a need for civic education and the promotion of public order and peace. In effect, “there is no authentic and stable democracy without social justice. Thus the Church needs to pay greater attention to the formation of consciences, which will prepare the leaders of society for public life at all levels, promote civic education, respect for law and for human rights, and inspire greater efforts in the ethical training of political leaders”. (Ecclesia in America, No. 57). Capitalism, which Smith outlines in his magisterial Wealth of Nations, is founded upon an ethics of sentiment and want and takes on the form of exchange between parties–I give you what you want and you give me what I want. This is why Enlightment liberty must always be coupled with capitalism. If reason is not the arbitor of proper action, then all people must be free to pursue their wants according to sentiment. Toss in some J.S. Mill and Bentham in order to give capitalism the flavor of utilitarian mode–I am at liberty to pursue my wants, which I decipher from my sentiments, as long as such a pursuit works for the benefit of the majority. That is the capitalist/utilitarian ethic. . . .
[I]t is true without a hesitation that the capitalist ethic is fundamentally at odds with the entire moral tradition of the Catholic faith, and that the capitalist ethic (to use the words of Aladair MacIntyre) is a rival morality to Catholicism. Pope John Paul II and Pope Benedict XVI understood this. Of course, the Catholic defenders of capitalism never care to debate its intellectual formulation for they know it is flawed. Instead, they refer us to the “material prosperity” of free market societies in order to justify the good of capitalism. But what else is such an empirical reliance than a consequentialist defense of a system that rejects the dignity of the human person (indeed, there is no person!) and reduces societal interaction to mere exchange! the Church has elevated certain elements of the classical liberal agenda—and without compromise—by divorcing liberalism from its historic excesses. By situating liberalism within a Christian philosophical and theological framework, the Church has sufficiently anchored liberalism’s vision of individual liberty and human rights in a proper anthropology. This process began with Pius IX’s 1864 Syllabus of Errors, which condemned the radical elements of the liberal movement, and has continued all the way through John Paul II’s encyclical letter, Fides et Ratio. By asserting this, however, I am also recognizing that the Church has condemned the excesses and abuses of liberalism. Among these would be the errors of atomistic individualism, the absolute right to private property, the idea that law originates from the will of the people, and the rejection of legitimate authority, especially the moral authority of the Church. Yet I would suggest that these condemnations, and others, have been carefully focused on specific errors of liberalism so as not to disregard many of the key insights that liberals advanced, such as religious liberty, freedom of association, and economic liberty. Admittedly, the Church has prudently taken more than a century to develop her teaching on these matters. Consequently, the nuancing of liberalism has been gradual and slow to develop. Neo-liberalism simply reflects those moral dispositions that are unacceptable to the Church in the marketplace. Thus, neo-liberalism is not synonymous with the free economy, nor does the market necessarily produce these excesses even though it might appear that way. I would even suggest that this moral disposition precedes any economic system, in as much as it is part and parcel of man’s fallen nature. This distinction between the free economy and neo-liberalism is absolutely necessary if one is to properly understand the Church’s teaching about the economic order. Yet is this intrinsic to the free economy—insofar as the free market refers to the voluntary exchange of goods and services and the protection of property rights—or is this simply a reflection of the moral blindness of those who espouse such a minimalist view of the human person? In other words, is it impossible to admit that individuals are capable of moving beyond selfish interest when acting in the market? Or is market activity fundamentally about greed? A morality that believes itself able to dispense with the technical knowledge of economic laws is not morality but moralism. As such it is the antithesis of morality. A scientific approach that believes itself capable of managing without an ethos misunderstands the reality of man. Therefore it is not scientific. This political task is not the immediate competence of the Church. Respect for a healthy secularity—including the pluralism of political opinions—is essential in the Christian tradition. If the Church were to start transforming herself into a directly political subject, she would do less, not more, for the poor and for justice, because she would lose her independence and her moral authority, identifying herself with a single political path and with debatable partisan positions. The Church is the advocate of justice and of the poor, precisely because she does not identify with politicians nor with partisan interests. Only by remaining independent can she teach the great criteria and inalienable values, guide consciences and offer a life choice that goes beyond the political sphere. To form consciences, to be the advocate of justice and truth, to educate in individual and political virtues: that is the fundamental vocation of the Church in this area. And lay Catholics must be aware of their responsibilities in public life; they must be present in the formation of the necessary consensus and in opposition to injustice. Just structures will never be complete in a definitive way. As history continues to evolve, they must be constantly renewed and updated; they must always be imbued with a political and humane ethos—and we have to work hard to ensure its presence and effectiveness. In other words, the presence of God, friendship with the incarnate Son of God, the light of his word: these are always fundamental conditions for the presence and efficacy of justice and love in our societies. Catholics have responded to this call in many different ways. One way is that of the Catholic Worker, taking on voluntary poverty in solidarity with the least among us. Then there is the Acton Institute, which according to its stated mission seeks to “to promote a free, virtuous, and humane society” by integrating “Judeo-Christian truths with free market principles.” Which sounds, to me at least, not unlike what then-Cardinal Ratzinger had in mind when he spoke of joining “specialized economic understanding” with ethical discipline and religious strength, so as to properly order our economic activity. I am reminded here of the collaboration of theologians and economists in the realtively new school of economic personalism, which upon initial reading aims to develop a “nuanced synthesis of free-market economic science and the science of moral theology grounded in a personalist anthropology” — a laudable if not challenging task. (For starters, see “The Need for Economic Personalism” (Markets and Morality Volume 1, Number 1. March 1998). Does the Pope Blast Capitalism?”, by Fr. Robert Sirico. Responding to allegations that Jesus of Nazareth contains an indictment of capitalism. Hans Urs von Balthasar and Mother Teresa’s "Dark Night of the Soul"